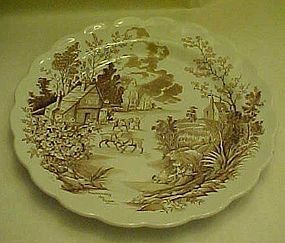 Pretty brown transferware plate by Ridgway of Staffordshire England. The original Coaching Days & Coaching Ways, All colors underglaze and detergent proof. MEasures almost 10" in diameter. Front of plate is titled "Harnessing the team, and is a neat transfer pattern of old days gone by/ Scalloped edge/ Perfect condition, with NO chips or cracks. I have 2 available and price is for each plate. Both are PERFECT. 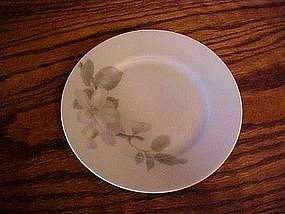 Antique Moyune pattern dinner plate by Ridgways England. Sometimes this flow blue pattern has coloring on the flowers, but this one does not. 9" diameter. Gold edge trim, which is worn. No chips or cracks, but there is crazing. I just have one available. 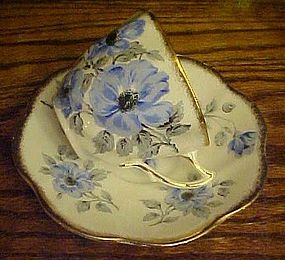 Rosina Blue Flowers tea cup & saucer. Porcelain. England. c. 1952+. An elegant transfer pattern of large flowers in shades of light blue with gray leaves decorate this pretty shaped cup & saucer. 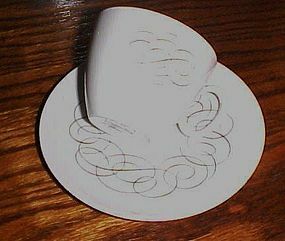 Both the cup & saucer are deeply scalloped & the cup is fluted as well. White background. Gilt trim with gold sponging on top, gilt ring at cup foot & lining on cup handle. Stamped with a rose & crown, Made in England Bone China ROSINA. Excellent condition. A very attractive cup & saucer. Rosenthal Contenentl script pattern cup n saucer 2 5/8"
Rosenthal fine china cup with matching saucer by Continental, Germany. Fine white china cups measure 2 5/8" tall. White with Black script pattern by Raymond Loewy. I have 6 sets available and price is for 1 cup with matching saucer. All are in pristine condition. Made 1961-1964 only. I have other pieces listed in this pattern.THe picture does not show well as the flash has washed out the photo. THe scroll is perfect and crisp, and not faded, guaranteed. Rosenthal fine china saucer (only) by Continental, Germany. This saucer fits all of the varios cups that go with this set. White with Black script pattern by Raymond Loewy. I have 3 single saucers available and price is for 1 saucer. All are in pristine condition. Made 1961-1964 only. I have other pieces listed in this pattern.. THe scroll is perfect and crisp, and not faded, guaranteed. Gorgeous and delicate Donatello shape. 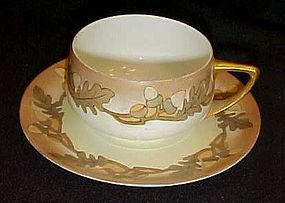 Rare hand painted acorns and oak leaves border on cup and saucer. Airbrushed in pretty fall colors and the acorns have a lustre to them. saucer measures 5 5/8" across and cup is squatty and 1 7/8" tall. 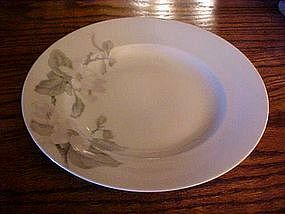 Pristine condition and is made f a fine thin china. Green Rosen thale Donatello Bavaria Mark. This is a beautiful scalloped edge Rosenthal Malmaison demitasse cup and matching saucer, that was made between 1898 and 1908. Possibly a childs ize to an old tea set. 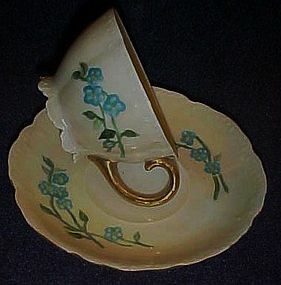 It has gold edging and handle, with sprays of hand painted blue flowers and airbrushed blush edges. The set is in excellent condition, free of chips or cracks. The back is marked in green with the crown and swords with R. C. Malmaison Bavaria. Saucer measures 4 1/4" in diameter. Date was hand painted on the bottom 10/16/08. Large cream soup bowls measure 8 3/4" in diameter. 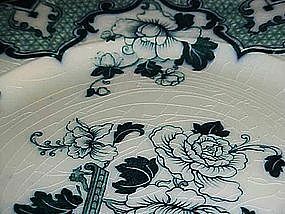 Pomona pattern by Rosenthal. Marked R C with crossed swords and crown logo, Rosenthal, Kronach..Germany ~Pomona. I have 10 of these great bowls available. but price is for each. Let me know quanity when ordering please. 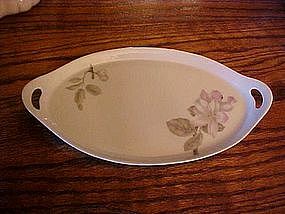 9 by 5 1/4" oval serving dish in Rosenthal's Pomona pattern. Marked with the R C crossed swords and crown logo. Kronlach..Bavaria HORTENSE ~Pomona. I have two exact ones, price is for each, and both are in pristine condition. See more pieces of Pomona in my catalog. 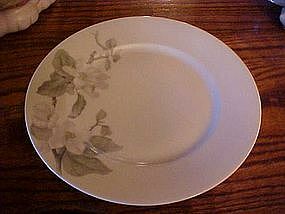 Large 10 1/8" dinner plate in the Pomona pattern by Rosenthal china. Marked on the back R C with crossed swords and crown logo,kronach..bavaria, ELSE, ~Pomona. There are 7 of these plates available, price is for each. Each piece is in pristine condition! See my catalog for more great pieces to this set! 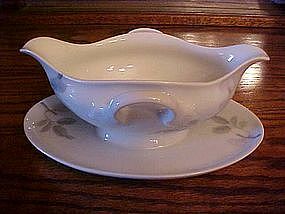 Beautiful vintage gravy /sauce boat with attached underplate by Rosenthal. Hard to find pieces to this set. This large gravy boat is in perfect condition! It measures approx 9 1/2" long, has two pour spouts and two handles.Marked with the R C crown and crossed swords, Kronach..Bavaria ELSE ~Pomona. I actually have two of these, which is a rarity! Price is for each. I have other nice pieces to this set that I will be adding, see my catalog. I believe this is the largest of the platters made in the pomona pattern by Rosenthal. 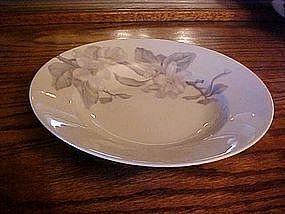 Oval platter measures 15 1/4" long. Fantastic, pristine condition! Marked with the R C crossed swords and crown, Kronlach Bavaria, HORTENSE ~Pomona. A lovely addition to your set, and hard to find! I have more pieces in this pattern available in my catalog. 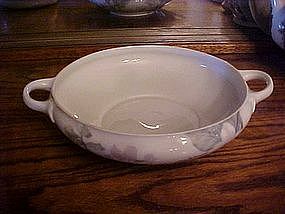 Large wonderful rimmed serving / vegetable bowl in the pomona pattern by Rosenthal. Round shape bowl measures a generous 10 1/8" in diameter. Marked on the back R C with crossed swords and crown logo,kronach..bavaria, ELSE, ~Pomona. I have 10 of these available. Price is for each, and each is in pristine condition. I have other pieces to this set available in my catalog. 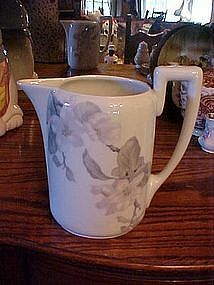 Large pitcher in the pomona pattern. Pitcher measures 6 1/2" tall, plus handle height. Decorated on both sides. Marked Rosen thal crossed swords and crown logo. Selb-bavaria JSOLDE. Absolutely perfect condition!! Another rare piece to this set. See my catalog for other hard to find pieces to this set. 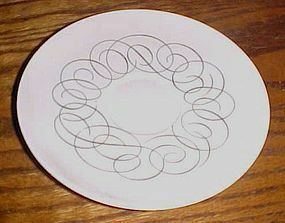 These are the 6 1/8" bread and butter plates in the pomona pattern by Rosenthal. easch plate is marked Rosen thal, crossed swords and crown logo,Korlach..Bavaria ELSE ~Pomona. I have 6 available in this size. All are in perfect condition and are priced per plate. Let me know quanity when ordering. I also have more pieces in the catalog to this pattern, if interested. THis is not a marked Rosenthal piece, but it is however the pomona pattern and is exact. It came in with all of the Rosenthal china pieces, so they did use it as a matching piece. The backstamp reads Made in Czechslovakia MZ Altrohau CMR, and has the number 1749 stamped into the mold. 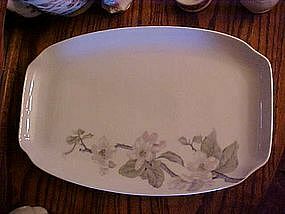 The small oval tray measures 9 7/8" by 5 3/4". It is in pristine condition. A great piece for your china service. 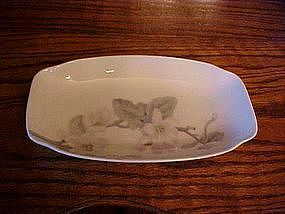 The covered vegetable bowl in the Rosenthal Pomona pattern. Measures 12" handle to handle and is approx 5" deep to the top of the lid. Marked on the bottom with R C crossed swords, crown logo. Kronach..Bavaria ELSE, ~Pomona. This is in pristine condition, and a hard to find piece for the set. I have other pieces to this set I will be adding to my catalog. 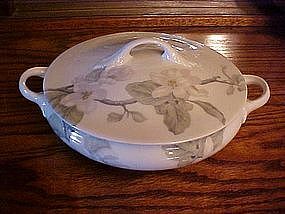 Bottom part of the large round vegetable / casserole dish in the pomona pattern by Rosenthal china. Pristine condition, and a great find if you have broke the bottom to yours. Top diameter of bowl is 8 1/4". I have a complete one shown in my catalog also, if you need to view it. Marked R C with the crossed swords and crown logo, Kronlach..bavaria ELSE ~Pomona. Perfect condition.